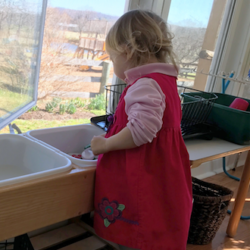 Village Montessori School, accredited by the International Montessori Council, is a peaceful and nurturing place, lovingly prepared for the toddlers, preschool, primary, and elementary school children of Loudoun and Clarke Counties, and West Virginia. We are located in a quiet and pastoral setting in Northern Virginia – an ideal learning place for children and their parents. VMS has has provided an excellent education to local children for 13 years. 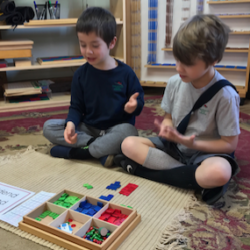 With over 75 years of experience, our dedicated team of certified Montessori teachers and assistants embraces Maria Montessori’s core value of deep respect for the individuality of each child and the understanding that all children are born with the inherent ability to achieve their full potential. Enjoy this 5 minute YouTube video on one parent’s perspective of the core contrast between Montessori and conventional schools! This class is designed to meet the developmental needs of children 18-36 months old. All children attend five mornings a week. As readiness increases, the option of adding afternoons is available. 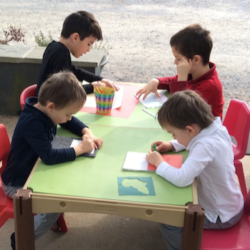 Elementary Montessori is designed to meet the changing intellect and personality of children of ages six to twelve.